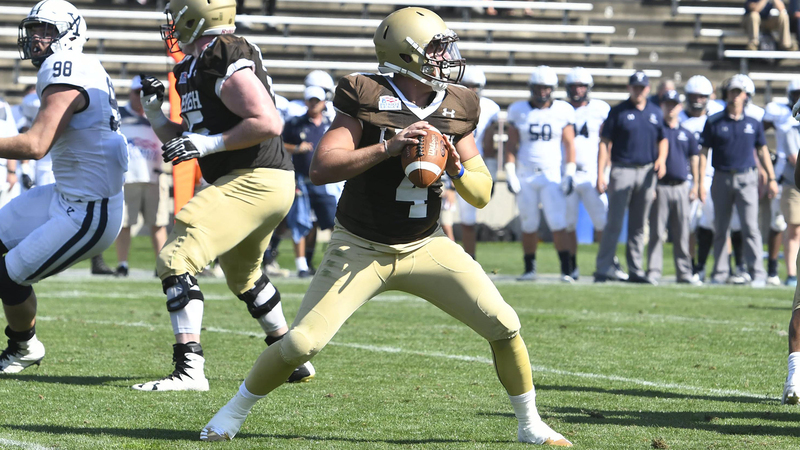 Lehigh's spring session is in full swing, and there's no question who the opening-day starter will be at quarterback, barring injury - that would be rising senior QB Brad Mayes. That doesn't mean Mayes is sitting back sipping an iced tea while his teammates are busting their humps this spring, however. He's been busy. "This off season was a lot of fun for me," he told me. "I got to take on more of a leadership role which allowed me to make great strides in the weight room. We had an outstanding leadership council as well make some great strides in equipment and gear, nutrition, and alumni partnership. Although those may seem like little things when it comes to the game of football, stuff like looking like a team and matching on Saturdays really go a long way." Brad's numbers last season - 3,866 yards passing, a 64 % completion rate, and 31 touchdowns - were outstanding. However, it's in the turnover department where Brad has been focusing so far. Last season, he had 12 interceptions, though he didn't throw a single interception in Lehigh's final three games of the year vs. Holy Cross, Lafayette, and Stony Brook. And Brad thinks he can improve even further. "Personally I'm working on trying to limit my mistakes," the Tampa, Florida native said. "Last year I turned the ball over too many times, so to work on this me and the defensive backs made a little wager - if I throw eight or more interceptions, I have to take them out for wing night, and if I throw less they all have to get me a coffee or something along those lines." Lighting that competitive spirit kept Brad very sharp in the early part of spring. "Through 7 practices they only have one interception so that's a positive on my end," he said. "I think everyone really respected how he played and how he performed," offensive coordinator Scott Brisson said on LehighSports.com about Brad's season last year. "Where he needs to develop, quite honestly, is as a leader. It really is [going to be] his team. And being a leader doesn't mean just being vocal, it means being elite in your preparation all week long, being more short-term oriented, and doing what you have to do on a consistent basis." There's also that little matter of his two top receivers from last season, who are moving on. WR Gatlin Casey will be playing his graduate year at Middle Tennessee State, and WR Troy Pelletier, who should find himself on an NFL roster this August, is preparing for whatever comes during the day of the NFL Draft. Brad is excited about the new crop of receivers going into the upcoming season, especially two wideouts who have had their college careers slowed down by injuries. "Although I lost potentially two of the best receivers to ever come through our program," Brad told me, "I am excited to get senior WR Luke Christiano and senior WR Sasha Kelsey back. We also have sophomore WR Jorge Portorreal coming back, who looks great and is now becoming more of a student of the game and is bettering himself through film. Then there is senior WR Conner Bianchini and junior WR Devon Bibbens, who both have some playing time but now I have to expect them to step up and fill the holes that Gatlin and Troy left." Christiano, who hails from Cranford, NJ, played tremendously well in the first couple of games last season before a season-ending injury at Monmouth cut his season short. Portorreal, who had 56 receptions for 729 yards, was explosive last season after moving into Christiano's slot position. Kelsey also battled injuries in prior years and saw his time limited last season, no thanks to Pelletier and Casey arguably being the best 1-2 receiving combination in all of the FCS last season. Still, Kelsey did haul down some important passes last season, none more important that his catch versus Lafayette in Lehigh's thrilling 38-31 win in the 153rd edition of The Rivalry. Down 31-21, and needing a 4th down to keep a critical drive alive, Mayes fired a perfect slant pass to Kelsey for a 1st down. The drive ended with a touchdown, helping spur of 17 unanswered points and allowing the Mountain Hawks to not only beat their Rivals, but win back-to-back Patriot League Championships. Lehigh fans are certainly hoping to see a lot more Mayes-to-Kelsey connections in the 2018 season, as well as seeing Bianchini's skills as well. "Conner has outstanding route running ability and is arguably one of the best 50/50 ball catchers I have ever been around," Brad added. "Devon is a guy that I also think runs outstanding routes and is very quick and elusive, who really loves the game of football and doesn't back down from any challenge. I'm excited to work with these guys because we all have strong relationships off the field." The building of the passing and receiving corps is only one part of the spring, too - it's also about building the foundation for the 2018 season and beyond, as junior QB Tyler Monaco and sophomore QB Addison Shoup are in a competition to see who might get the call if Brad is unable to go at anytime during the season. "We need to get a guy ready to go that can run the whole system that we have with Brad currently," Brisson said. "What we need out of our backup quarterback is to run the offense at the same level as our starter. And it's a challenging job, since you don't get as many reps during the season as the starter." Monaco, whose hometown is Davie, Florida and missed all of last season due to injury, and Shoup, who hails from Marietta, Georgia, go into this season neck-in-neck for the backup QB position by all accounts. Neither have thrown a varsity pass for the Mountain Hawks, so their action here will be Lehigh Nation's first look at either one of them.